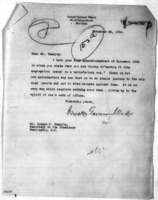 Letter from Anderson to Tumulty describing his successful attempt to call off a meeting with Mr. Trotter and saying that his job may be threatened as a result. 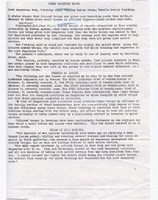 Terrell encloses a clipping from the Indianapolis World he describes as the "sanest utterance" he's seen on the Trotter incident. 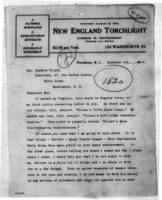 Joseph W. Henderson, editor of the New England Torchlight writes to Woodrow Wilson disagreeing with Wilson's stance in favor of segregation in the government departments. 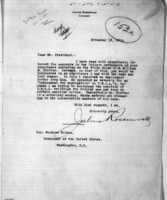 Asking President Wilson to act against segregation in the government departments. 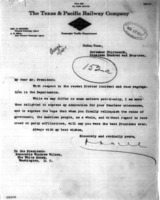 Apologizing for the manner in which WM Trotter addressed the president and describing the plan of the American Colonization Association to create a new Liberia on American soil for African Americans to govern themselves. 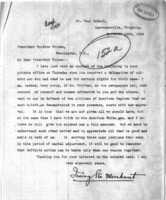 Tumulty acknowledges receipt of letter and say he will bring it to the attention of the President. 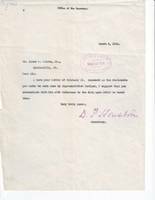 Sending resolutions made by the Methodist Episcopal Preachers' Meeting regretting Woodrow Wilson's backing of separation of the races in government employment. Villard urges Tumulty to end segregation and discrimination by "living up to the spirit of one's oath of office." 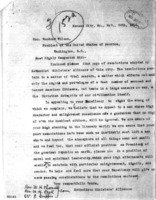 Letter to the editor equating Wilson's treatment of Trotter with his treatment of women suffragists. 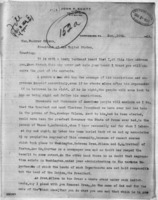 Letter to the Editor answering the letter of Alma Whitaker regarding the south. 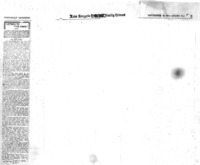 Note introducing clippings from the Los Angeles Daily Times which she is enclosing. 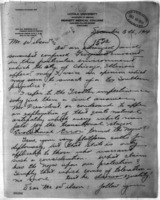 Thoughtful letter disagreeing with Trotter's methods and trusting that the "episode in question will not be allowed to lessen your sympathy." 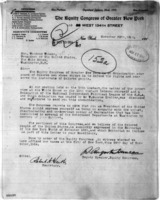 The Equity Congress of Greater New York expresses their protest of Wilson's support of segregation in the federal government. 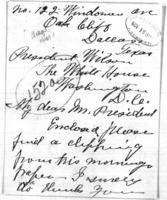 Letter from the President and Secretary of the Saloonmen's Protective Union No. 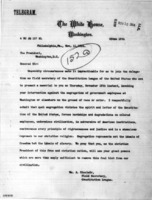 1, protesting Wilson's support of segregation in the Federal government. 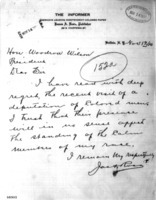 Letter expressing regret that "W.M. 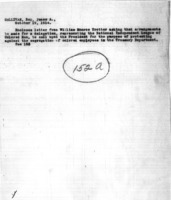 Trotter and his Committee proved to be unqualified for the mission they sought to perform." 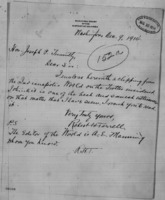 Thanks Moton for his letter and his good judgment. 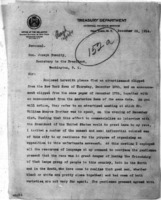 Letter from the district secretary of the American Missionary Association saying that the issue of segregation cannot be sidestepped any more than the issue of slavery could have been in the nineteenth century. African American letter writer criticizes Trotter. 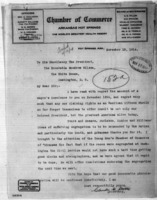 Translation of an editorial from a German newspaper of Saint Louis, Missouri, referring to the Trotter incident and condoning segregation in the federal government. Newspaper article about the Trotter incident. Writer believes Wilson had a right to be displeased, presumably by Trotter's conduct. 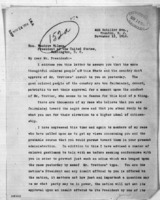 Letter saying that the sentiment of the African Americans in the South is not the same as Trotter's and sending blessings for Wilson's continued success. 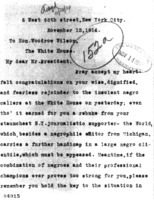 Letter expressing regret over the Trotter incident and talking about the race problem in the U.S. 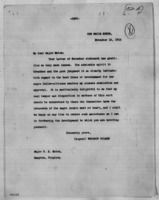 Expressing sympathy with Wilson's administration and endorsing Mr. R. S. King for a position in that administration. Clipping from unidentified newspaper about the Trotter incident. 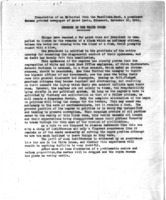 Newspaper article or editorial on the complexity of race issues in the United States. 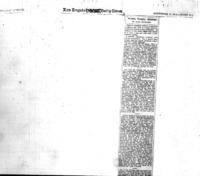 Newspaper clipping about segregation in the federal government departments. 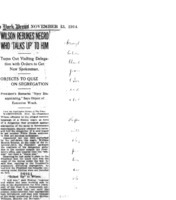 Fragment of clipping from unidentified newspaper about segregation in the federal government under Woodrow Wilson. 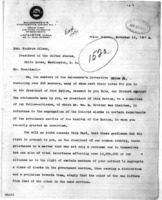 Newspaper article, "Jim Crow Law at Washington." 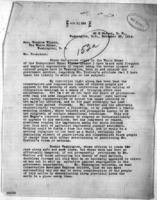 Letter to Woodrow Wilson listing reasons why segregation of government employees should be abolished. Ross trusts that the Trotter incident will not affect the "standing of the calm members of my race." 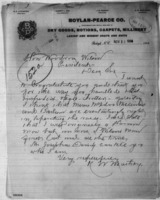 Letter on letterhead of The National Co-Operative Association of America saying that the writer is glad Woodrow Wilson reprimanded Trotter and informing him of a national congress to be held in Jersey City, NJ in September, 1915. 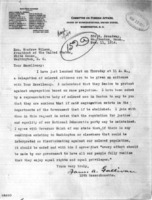 Letter to Woodrow Wilson from James A. Gallivan urging abolition of segregation in the federal government so that the reputation for justice and equality in the Democratic party may be maintained. 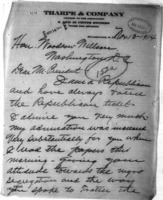 Notes about letter from William Monroe Trotter sent by Rep. James A. Gallivan. 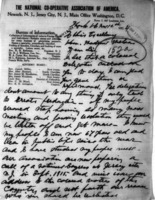 John Skelton Williams asks Joseph E. Ralph why different races were "working together side by side" in the Bureau of Engraving and Printing. 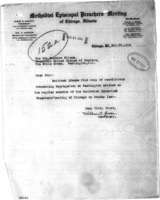 Letter to the Attorney General of the US suggest the views of African Americans can be obtained from the Association for the Advancement of Colored People. 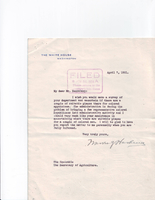 Asking Secretary of Agriculture to find places for African-American Republicans in the Department of Agriculture. 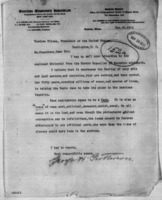 Sends list of African-American employees of the Forest Service employed outside Washington, D.C.
Sending list of African-American employees in the Forest Service in Washington, D. C.
Asks the Secretary of Agriculture to what extend the remarks of Representative W. P. Borland on African-American employees may have been justified. 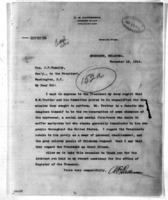 Surgeon General responds to request for statement showing name of each messenger and laborer employed in the Bureau. 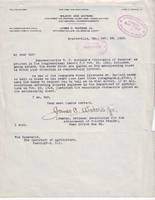 Undated description of efforts to aid African-Americans through the Bureau of Education of the Department of the Interior and the Department of Agriculture.